The 270-lot event on March 27 – the first for Philip Smith since he left Mallams – blended 20th century and contemporary work by both British and international artists across a range of mediums from studio ceramics to silver and jewellery design. The sale enjoyed a decent crowd and a 78% selling rate, with more than a third of sale participants new to the auctioneers. The selection of studio pottery was a near sell-out with most pieces sold to private collectors. Pieces by Lucie Rie (1902-95) ranged from a group of 34 pressed glass buttons made when she arrived in London as an Austrian émigré in the 1940s sold for £2200 to a sgraffito decorated conical bowl c.1972 in white, amethyst and manganese glazes that doubled estimate when it sold for £28,000. Both lots were fresh to the market, the former acquired from the artist’s Albion Mews studio, the latter bought by the vendor at the Primavera gallery in Cambridge in the 1970s. 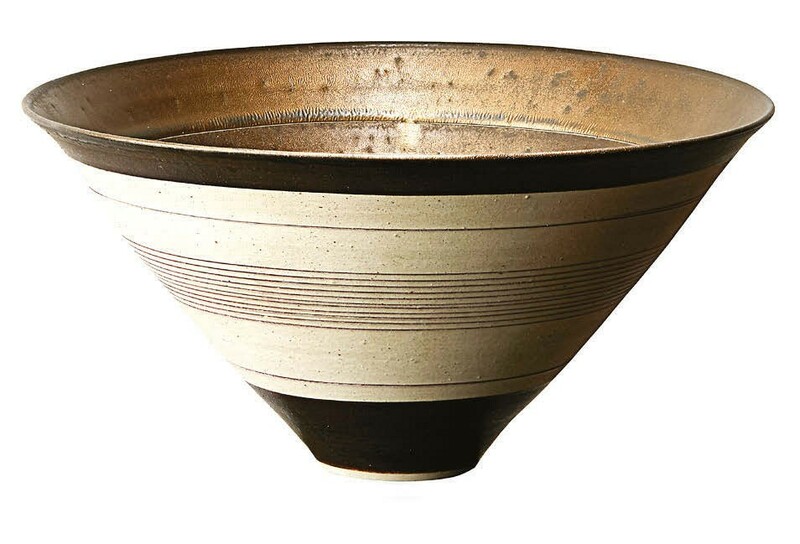 The acceleration in the prices achieved by ceramicists still living today has been particularly marked. The pottery of Jennifer Lee, winner of the 2018 Loewe Craft Prize, has reached new heights in the past year. Here an early work, the 8in (20cm) high Papoose Vessel, sold at £6500. This piece, the clays coloured using oxides and underglaze colours, was made in January 1982, when Lee was in the second year at the Royal College of Art. New auction records were set for Julian Stair (b.1955) whose eight thrown coloured porcelain cups and beakers on a pedestal sold at £3000 and for Isle of Wight artist Matthew Chambers (b.1982) whose signature spiralling form Yellow Twist, 2014, took £2600. Pablo Picasso also played an important role in the revival of the artisan potter through his work with the Madoura Pottery. 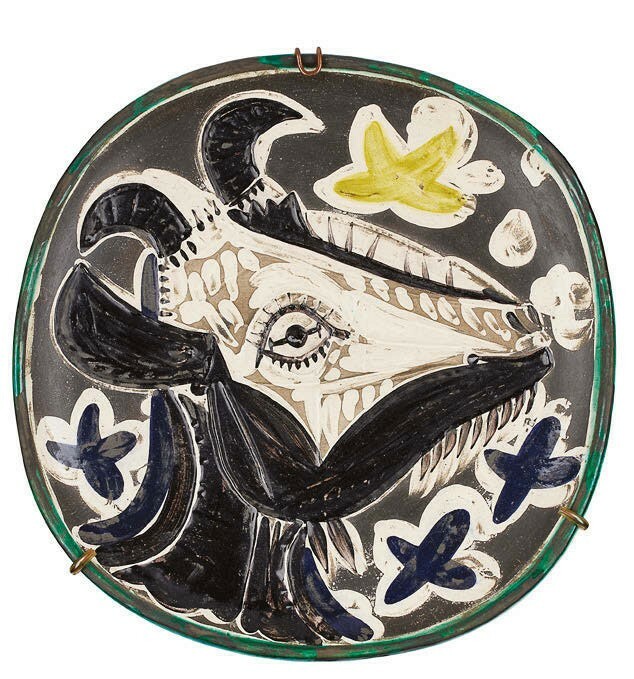 His Tête de chèvre de profil (Goat’s head in profile) a 40cm dish designed for Madoura in 1952 sold to an online bidder using thesaleroom.com for £11,000. Stamped and marked Madoura Plein Feu, Empreinte Originale de Picasso, it is one from an edition of 100. Popular too was a cross-section of works by Wendy Ramshaw (1939- 2018), the influential Sunderland-born jewellery designer who died in December last year. The doyenne of British post-war jewellery design first made her mark with humble paper jewellery sold through Mary Quant’s London Bazaar in the Swinging Sixties (here a paper and steel fan form brooch sold at £280) while examples of her trademark stacking ring sets sold for up to £1100. A pair of steel table screens – 16in (40cm) square maquettes for a pair of computer-cut double screens Ramshaw created for the staff restaurant at the Victoria and Albert Museum in 1996 – sold for £3400. Pair of 1960s lamps designed by Carlo Nason for Mazzaga – £3200. Particularly popular among the design pieces were a pair of 1960s blue and clear glass table lamps designed by Carlo Nason (b.1935) for Mazzaga. They more than doubled hopes selling at £3200. Also see Art Market this edition.